Everyone has their own memories of the seaside. It could be a family walk along the pier, sticky rock and candyfloss, sunburnt faces and the smell of suntan lotion, or the thrill of your first roller-coaster ride. The historian Allan Brodie has compiled a list of landmark buildings for Historic England – the public body that looks after the country’s heritage – which, he believes, sums up the best of the English seaside. The organisation, rebranded from English Heritage this year, is hoping to encourage more visitors to the seaside, a part of the UK that has been reinventing itself in recent years following a long, slow decline. The number of Britons taking seaside holidays has remained flat since 2008, according to VisitEngland. Its statistics reveal there were 12.9 million trips in 2014, with spending of £3.1bn, while there were 17.6m overnight trips in the same year bringing in £3.9bn. “It’s vital for seaside destinations to continually reinvent themselves and strive to attract visits all year round, and of course, investment is key,” said Lady Penelope Cobham, the chairman of VisitEngland. The organisation has been working to create jobs and drive growth in 35 coastal destinations which have benefited from government funding. One of the success stories is Kent, which has more Blue Flag beaches, denoting clean water, than anywhere else in the UK. In June it was named Lonely Planet’s Top Family Destination in Europe, following a decade of work to transform its image. “Our seaside towns and resorts are rich with history and the seaside holiday is a pastime entrenched in fond family memories,” Lady Cobham said. But although trips to the seaside have remained popular, “they haven’t seen the growth that other types of holidays have enjoyed throughout the recessionary years, for example the rise in city breaks”. He believes the traditional “two-week holiday at a seaside resort” has not disappeared and there are “still people who do it”. But the majority of visitors to the coast now are on a short break or a day trip. Although people had been bathing in the sea since the 16th century, things started to get more organised from the 1720s onwards, when Liverpool became one of the first seaside resorts, said Mr Brodie. By the end of the 18th century “several dozen coastal ports had added a holiday function to their economy”. The development of the railway in the mid-19th century led to mass tourism and the boom years of the seaside resort ran until the 1970s and 1980s, when cheap package holidays and the appeal of foreign climes sent the British seaside into decline. The fact that much of the remaining infrastructure at seaside resorts was designed for far larger numbers of visitors has put many of them “on the edge of viability”, Mr Brodie said. He concedes that many resorts still have areas that are “terribly deprived” and “there are still lots of issues troubling seaside resorts”. But, he adds, “they are still great to go to”. 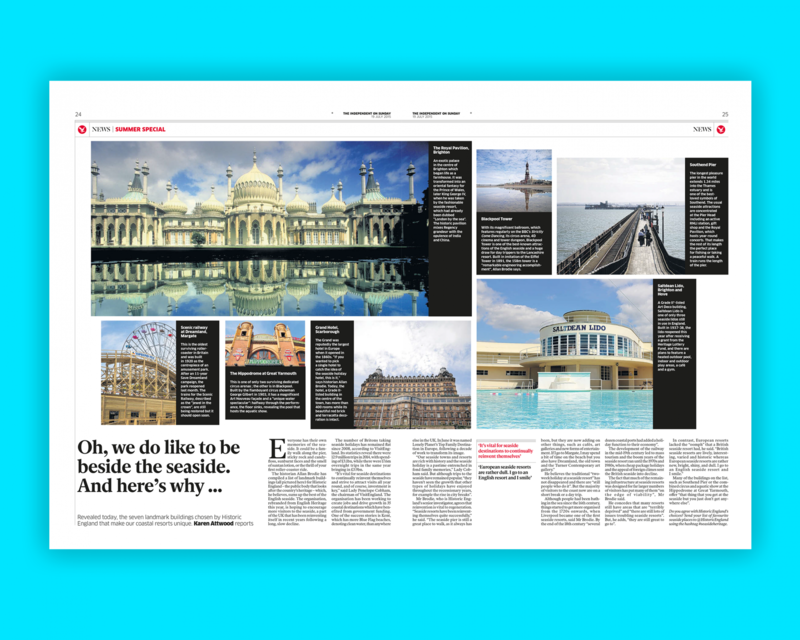 Many of the buildings on the list, such as Southend Pier or the combined circus and aquatic show at the Hippodrome at Great Yarmouth, offer “that thing that you get at the seaside but you just don’t get anywhere else”. Do you agree with Historic England’s choices? Send your list of favourite seaside places to @HistoricEngland using the hashtag #seasideheritage. An exotic palace in the centre of Brighton which began life as a farmhouse. It was transformed into an oriental fantasy for the Prince of Wales, later King George IV, when he was taken by the fashionable seaside resort, which had already been dubbed “London by the sea”. The historic pavilion mixes Regency grandeur with the opulence of India and China. With its magnificent ballroom, which features regularly on the BBC’s Strictly Come Dancing, its circus arena, 4D cinema and tower dungeon, Blackpool Tower is one of the best-known attractions of the English seaside and a huge draw for day trippers to the Lancashire resort. Built in imitation of the Eiffel Tower in 1891, the 158m tower is a “remarkable engineering accomplishment”, Allan Brodie says. This is the oldest surviving roller-coaster in Britain and was built in 1920 as the centrepiece of an amusement park. After an 11-year Save Dreamland campaign, the park reopened last month. The trains for the Scenic Railway, described as the “jewel in the crown”, are still being restored but it should open soon. The Grand was reputedly the largest hotel in Europe when it opened in the 1860s. “If you wanted to pick a single hotel to catch the idea of the seaside holiday hotel, this is it,” says historian Allan Brodie. Today, the hotel, a Grade II-listed building in the centre of the town, has more than 400 rooms while its beautiful red brick and terracotta decoration is intact. A Grade II*-listed Art Deco building, Saltdean Lido is one of only three seaside lidos still in use in England. Built in 1937-38, the lido reopened this year after receiving a grant from the Heritage Lottery Fund, and there are plans to feature a heated outdoor pool, indoor and outdoor play areas, a café and a gym. The longest pleasure pier in the world extends 1.34 miles into the Thames estuary and is one of the best-loved symbols of Southend. The usual seaside attractions are concentrated at the Pier Head including an active RNLI station, gift shop and the Royal Pavilion, which hosts year-round concerts. That makes the rest of its length the perfect place for fishing or taking a peaceful walk. A train runs the length of the pier. This is one of only two surviving dedicated circus arenas ; the other is in Blackpool. Built by the flamboyant circus showman George Gilbert in 1903, it has a magnificent Art Nouveau façade and a “unique water spectacular”: halfway through the performance, the floor sinks, revealing the pool that hosts the aquatic show.